Sharon and I are watching the first year’s series of Downton Abbey over Netflix. What a treat. We missed the whole first two years because of our crazy schedule, on the road, out for the evening, never at home at the right time. We are just about finished with year one. What pleasure it has been. Not only the superb writing, acting, and directing, but the theme, the subject matter, portraying this special moment in time. Lord Julian Fellowes has created a world, the Downton world, where the ultra-aristocratic wealthy are located, seemingly in perpetuity, on top of that world. And then we catch glimpses of the enormous cultural, political, and economic changes of the early twentieth-century. Those changes swirl around Downton, and the ground beneath the aristocrats seems to shake. We also get sharp insights into the teeming life downstairs in the servant’s quarters. For the servants, each one given certain room for their own dignity, everyone knows the rules. There are boundaries, stated and unstated codes of behavior. A certain sense of order permeates everything. Order is prized almost above anything. At times, both upstairs and downstairs, individuals chaff at the constraints of rigid boundaries, but everyone accepts the rules of the game. Why is this drama is so appealing to Americans? Why would we, who pride ourselves in strong classless convictions, be so swept up in early twentieth century aristocratic hierarchy. We are the ones, after all, who originated the American dream, the possibility that anyone, no matter one’s station at birth, could rise through the ranks, could rocket from rags to riches. That is not the national narrative of Britain, where tight social order determines the prospects of one’s life. So why the enormous attraction? In a wonderful interview in last Saturday’s Wall Street Journal, Julian Fellowes, the writer of Downton Abbey, says the Downton world “seems like an ordered world at times, and ours feels like a rather disordered world.” Perhaps this is one cue to our love of this drama: We long for an order that may be disappearing from our lives. Here’s another thought: “Political structures seem a bit wobbly,” says Fellowes, “and we don’t seem to have quite the faith in them” we used to. In contrast, in Downton Abbey, we witness a level of respect—for individuals, for tradition, for institutions—a kind of respect that seems profoundly lost in our day. Perhaps this is something we long for as well. 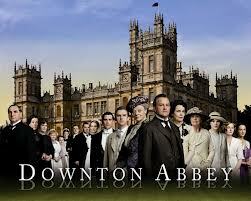 Downton is a place with clear rules, but “our rules” these days, says the author, “are so nebulous. None of us quite know what they are.” Perhaps here’s another reason we look into this world with such curiosity, even longingly. Well, things were changing rapidly and dramatically at the beginning of the twentieth century, changes that would impact our world profoundly. Downton is clearly not immune from those changes. But we look back with some nostalgia, perhaps some longing for the order of Downton, some wistfulness about respect, for one another and for our institutions, some sense that wouldn’t it be nice if our rules really did make some things right and some things wrong. Wouldn’t it be nice, we feel as we watch this wonderful show. I know we are in the third season. Sharon and I are going to take it one evening at a time until we finally catch up. I know there is much yet to unfold, but oh what a delightful ride along the way. I wonder, too, if Downton appeals to our longing for beauty and refinement. Do we feel that more keenly as our society veers in another direction? Phil, this is great. We are also watching the series. I saw the first two seasons last year as I was recuperating from surgery. Your reflections are wonderful. We had also read the WSJ piece. Seems we are so far away from that comfortable place of knowing our place and roles etc. and accepting that especially in our egalitarian American culture. Of course that is easy for me to say as I am, and always have been, one of the “haves”, upstairs as it were! but fun and loving and sweet. I probably won’t respond to each of your postings, but please do know that we really enjoy reading them, and I always take away some things to ponder. It’s a real contribution and I hope you know how much you are appreciated.